Everyone that takes care of their well being tries to find a healthful method of preserving food. Well, there is no better solution than to invest in a food dehydrator and start making homemade dried vegetables, fruit or meat. Dried food that is commercially bought is conserved fresh by adding different sorts of chemicals that can be the origin of some health problems, like blood sugar, or even headaches. All of that can be avoided by making your own dried food using nothing but healthy and organic ingredients. 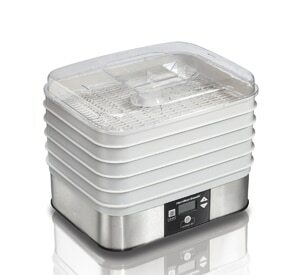 As food dehydrators are becoming more and more popular and there are so many on the market it is hard to choose one. Lucky for you we are here to test and review top rated products on the market, and this time it is Magic Mill Pro Food Dehydrator turn. Read on and find out why it is so popular. Magic Mill MFD 1010 is made of stainless steel. It’s a box type device with a half see-through door. The fan which is located at the back of the unit is made of same material. It has one placeholder for each hand on each side for easy transport of the device. The digital timer and control panel is placed at the front of the unit so the device itself can be placed in the cabinet or even a wall. Just make sure to provide breathing room for holes on the sides for humidity to go out. The inside of this device is made of metal with metal mesh sheet protecting the rear fan from any damage that could happen while loading the unit. The MFD 1010 has ten placeholders for ten removable stainless steel trays. For liquid produce like tomato slices or fruit leathers, there are ten mesh sheets that are included in the packaging. Magic Mill Pro XL food dehydrator is equipped with a back-mounted drying fan which is an improvement over some that have a motor placed at the bottom of the unit. Devices that have the heating element at the bottom produce a problem as they are heated, the hot air rises, and by the time it reaches the top tray it gets colder. This leads to another question which if not taken care of can cause burning to the bottom-placed food. Thus you must rotate your trays to get evenly dried produce on all the plates. With this device, you will not be faced with that problem as the fan and motor are placed in the back, so the air is evenly distributed across all stainless steel plates. 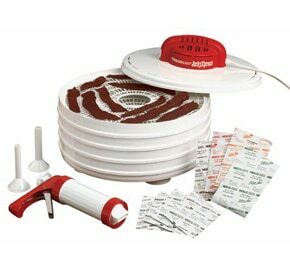 When you search for a dehydrator one of the most important features you should consider are thermostat and timer. Without a digital timer, you can’t put a precise setting for delicate drying. A temperature of the device can be set up from 95°F to 167°F. As most vegetables or fruits should not be dried at more than about 111°F this one falls in that range quite lovely, The timer is convenient as it will automatically shut off when the set time expires and therefore prevent any burning, so there is no need to keep an eye on it. The timer has a 24-hour range that should be plenty of time for any drying. 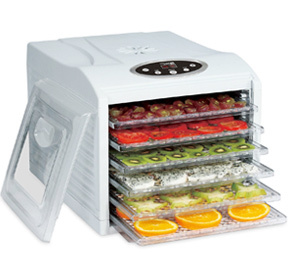 Magic mill pro food dehydrator has plenty of presets to choose the best temperature for a trendy variety of dried produce. Only with the touch of a button, you can start your procedure of ventilation, therefore, prevent any wrong temperature setting for your favorite snack. Unlike some other dehydrators on the market that have a swinging door which can easily drop, this one features regular side opening door. They are transparent, so there is no need to open them to check the improvement of the drying process. Many dehydrators have gaps between doors but with this particular unit that’s not the case as they entirely close the machine. Gaps serve a purpose as they allow the extra humidity to disperse out. With the MFD-1010 food dehydrator the gaps, or should we say beautifully placed holes, are located on the sides of the unit. Without those cracks, the drying system would not work as it should so they are a must in any dehydrator. The doors are also heat absorbent, so there is no need to be afraid to get burned while opening them. With its 52 pounds and 22.25 inches in width, 23.75 inches in length and 19’’ height you know it’s not the small device and that can store a lot of food for dehydrating. It can accommodate a whopping 13 lb so 1.3 lb for each tray. It might take up a lot of space on your countertop but it is worth having it in your kitchen. This is an excellent investment for whether a large or a small scale dehydration. The drying trays are easily removable so you can even place some larger items, for example, raising bread or producing yogurt. With the mesh sheets that are included in the packaging you can do stuff that has more liquid in, and they will not go through. You can even do things like fruit leathers. For those, you should use some of the five Teflon sheets also included with the packet so it can be easily peeled off since it is a non-stick made. If in any case some of the moisture drips down, a residue collection tray is located at the bottom of the case which makes it easier to clear once you are finished with drying. All the shelves and plastic residue container are easy to clean and are dishwasher friendly. Some similar devices in this price range don’t even come close to the features of this food dehydrator. Digital timer and transparent door, like all the extra accessories that are included in oven mitts or Teflon sheets when sold separately come well over this price point. And not only that it’s considerably larger than most of the competition with higher power capabilities with its 1000 watts. Although not much can be said about its one-year limited warranty one thing is positive about the device itself, and that is its premium build quality feel. With its shiny look that stainless steel gives you this a tool that will last you a lifetime. As one of the largets units amongst dehydrators Magic Mill Xl is an excelent working device that can be utilized for a variety of foods. It is designed to help you dehydrate all sorts of food in the most efficient way and produce a healthy homemade snack that is both nutritious and tasty. Dehydrated food keep its intense flavor, and you can enjoy in any of your favorite snacks even if they are out of season. As dried food take up less space, you can store lots of it without worrying about it getting spoiled. It’s well-made by an American company which used only the finest and safest materials. Although it has a few downsides such as the absence of a timer, it’s nothing one can’t handle.